I’m slowly tiring of all the fancy-schmancy, hi-test (and high buck) cultivars of bizarre-blooming perennials being rammed into the marketplace. 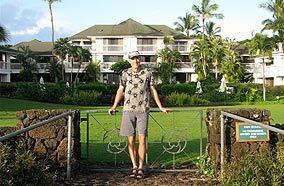 I’m not as interested in creating gardens anymore as I am landscapes, essentially an area of trees and shrubs that includes pockets and waves of perennials and annuals. So give me perennials with free flowing, natural form, attractive foliage, and lovely (but not overpowering) bloom. 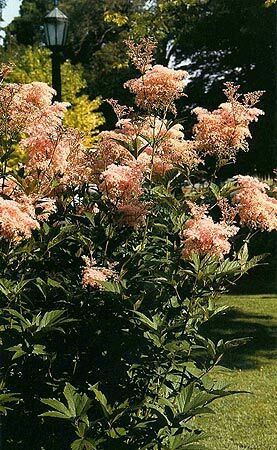 Give me filipendula. Filipendula ulmaria prefers partial to light shade. Dappled shade in the understory of mature trees is perfect, as are conditions granting morning sun/afternoon shade. Hot afternoon sun is tolerated if the plants are mulched well and the soil kept consistently moist. Even in dappled shade, don’t allow the soil to get too dry. Think of these plants the same way you do the astilbes and ligularias; provided the soil in the area drains fairly well, you pretty much can’t overwater. Soil should be neutral pH to slightly acidic, with ample organic content. Space plants from 18” to 24” apart. F. ulmaria will grow to 3’ tall (a few varieties, such as ‘Plena’ can hit 5’) with lovely, yellowish foliage that turns toward green as the growing season progresses. F. rubra (queen of the prairie) is the other species commonly available at nurseries, and is also a stellar perennial for less than full-sun areas of your landscape. Plants can reach 6-8’ tall in optimum growing conditions. Divide plants in spring or early fall, and use a sharp serrated blade when doing so—the clump can be a tough bugger. Plants self-seed fairly readily, so as you learn to identify seedlings, you may discover it’s easiest to dig up young plants found growing near the mother plant, and replant them elsewhere in the landscape. 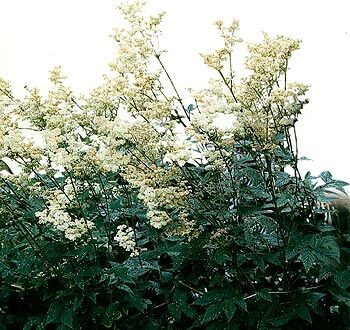 Don’t buy just one—filipendula looks best massed, so plant in threes, or fives, or more. Plants will do well (and look terrific) in moist areas, bogs, and alongside ponds and streams.